Large SOL STATION* spacecraft/space platform seen near the rim of the Sun. The large spacecraft/space platform has been positioned near the Sun for well over a month. Smaller winged spacecraft are often seen flying back and forth to SOL STATION SOUTHEAST. What is SOL Station Southeast - What does it look like? In life there is not always clear or easy explanations for the things we see. The numerous anomalies, which are referred to as spacecraft in the following solar SOHO images fit into the category of things we see that are not easily explained. For the most part the spacecraft defy and challenge our traditional way of thinking, and what we have been taught. The objects in question on the pages of SOL STATION SOUTHEAST and on the Sol-Cruiser pages were discovered by closely looking over SOHO EIT 304 and other SOHO EIT and LASCO pictures at the 1024x1024 pixel resolution, and then zooming in on the pictures for an even closer inspection. The pictures at SOL STATION SOUTHEAST and on the SOL-Cruiser pages continue to raise many more questions than what they easily answer. Each new picture adds a piece to helping solve the puzzle, but at the same time adds to the overall mystery of what the final picture will look like. These pictures and the images in them do seem to answer one very large question about extraterrestrial intelligence in the universe, and that is we are definitely not alone, and from all appearances the extraterrestrial intelligence is far more advanced than what the majority on this planet give them credit for. These beings, whoever they are, for all practical purposes and intent, appear to be able to actively harness and manipulate the tremendous energy furnace of the sun - something that humankind only dreams about for the most part. These images and the information they convey, can not be readily dismissed as freakish anomalies with little or no merit. They are not ice crystals or dust particles on the lens of the CCD camera. Something BIG is going on with the Sun, there is no doubt about that; the evidence is found in the increased solar activity, both in intensity, and in the number of solar flares and eruptions. What is going on at the Sun, centered around SOL STATION SOUTHEAST and the smaller winged spacecraft flying all around the Sun, and with the large circular disc appearing on and off from behind the Sun, is an entirely different matter. What matters, is that these things are happening and these objects are being caught on film, and what is going on, is not a scene out of a science fiction novel or movie - this is reality! What is SOL STATION SOUTHEAST? If pictures say anything [a picture is worth a thousand words], the images of this object indicate that the SOL STATION is several times larger than Earth. Even more intriguing than SOL STATION, what is the large circular disc, which SOL STATION seems to have some part in helping to hide, and/or conceal? The mass of the circular object, when it can be seen, and usually you will only catch a glimpse of part of it when you do see it, appears to be larger than Jupiter, possibly more than three times. The SOL Station space platform, space-station is seen inside the black framed area in this EIT 304 picture. Notice the circular looking vortex around the rear of the craft, as if it were some type of an energy or force field. The circular vortex like phenomena seen in this picture has been observed in other EIT pictures. A very distinct structure like assembly can clearly be seen at the front of the SOL Station in the lower left portion of the framed part of the picture. "...don't let the public know that you know they do exist." The SOL Station Mystery Deepens! 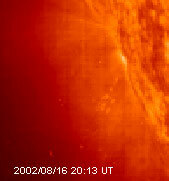 This unusual activity is going on just below SOL Station Southeast. Look at the hooked cloud and notice the small circular pattern of lights next to it, as well as the cloud like activity away from the main body of the Sun. A small ship like object can also be seen to the left of the hooked cloud. 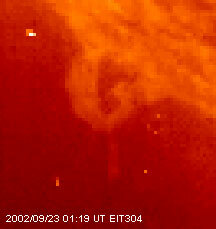 The following picture is an enlarged view of the hooked cloud like area. 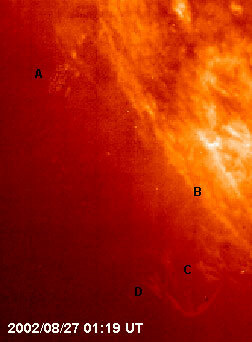 Enlarged view of the above EIT 304 picture, showing a closer view of the hooked cloud like formation and the circular object of lights to the right of it. More Images of the SunCruisers of Sol, the massive extraterrestrial spacecraft/space platform /space station known as SOL Station Southeast in the SE quadrant of the Sun, and the winged ET spacecraft in operation near the Sun. I can remember when you only saw a few SunCruiser's and other spacecraft near the Sun every once in awhile - a few times a year if you were real lucky. Now, more and more ET spacecraft traffic can be seen going to and from the Sun, and operating in and around the Sun, some of the craft operating very close to the Sun. Many of the winged craft, which some have affectionately named the Wingmasters of SOL, appear to be riding on the solar wind currents. One thing these craft all appear to have in common and continue to display, is the fact that ALL of these extraterrestrial spacecraft show qualities which indicate a high degree of deliberate and intentional design intelligence. A degree of intelligence and capabilities that far exceeds that of Earthly humans. Despite the increasing number of extraterrestrial craft, and the increasing frequency of visits to our inner solar system by these ET spacecraft, NASA continues its path of imposed silence and refuses to acknowledge the existence of these extraterrestrial spacecraft. As the images continue to show, these extraterrestrial spacecraft do exist, which clearly indicates that "We Are Not Alone" in the universe. What is that NASA fears, or more likely is hiding? "For most people, the question of whether or not we are alone in the universe is a mere philosophical musing - something of academic interest but of no practical importance. Even evidence that we are currently being visited by non-human advanced life forms seems to many to be an irrelevancy in a world of global warming, crushing poverty and the threat of war. In the face of real challenges to the long-term human future, the question of UFOs, extraterrestrials and secret government projects is a mere sideshow, right? Wrong - catastrophically wrong. The evidence and testimony presented in the following pages establishes the following." 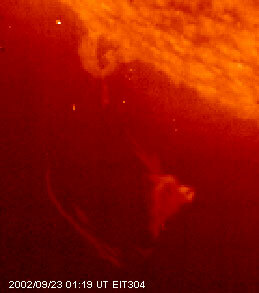 Winged craft seen flying close to the Sun and headed towards SOL Station Southeast on September 13, 2002 UT. SOL Station Southeast can be seen at the top in this inverted EIT picture. 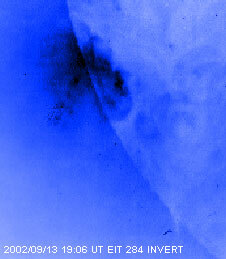 It is the dark structured image coming out of and partially hidden in the dark colored area of the picture. The same winged spacecraft as seen in the above picture, is located near the bottom right hand corner of this picture, and appears to be headed towards Sol Station Southeast. 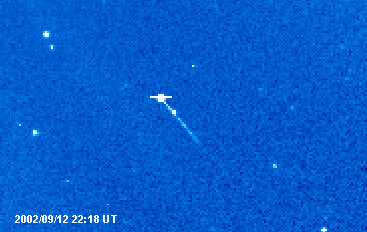 Image of a winged spacecraft as seen in an EIT 304 picture, a full twelve hours before the one taken at 19:06 UT. 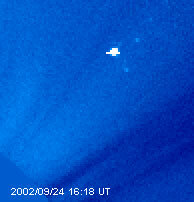 A winged spacecraft similar in appearance to the images of the ones seen in the above EIT pictures, can be clearly seen in this LASCO C3 picture, also taken on September 13, 2002 UT. Images of the winged spaceship(s) [WINGMAKERS of SOL] traveling near the Sun, and the massive stationship/space platform, "SOL STATION SOUTHEAST,"* positioned near the rim of the Sun, in the Sun's Southeastern quadrant. Image of winged spacescraft/scoutship, near the Sun's Southwest quadrant. Massive stationship/space platform at position A. Smaller winged spacecraft is seen at position B. No EIT images were available for 2002/08/31 through 2002/09/02. According to NASA, the EIT CCD camera was taken off line due to a "CCD Bakeout." Right before the bakeout there appeared to be a flash over of the Sun taking place. At any rate, there were no EIT images made available to the public during this time period. 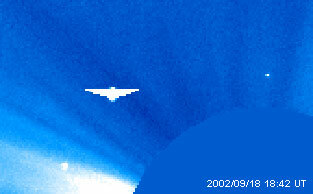 In this EIT photo taken on August 30, 2002, winged spacecraft at A can be seen navigating near, and in the vicinity of the SOL STATION at B. Thirteen hours after this image was taken, the EIT was taken off line by NASA, for what NASA said was routine maintenance [CCD Bakeout] of the CCD imager in the satellite. Triangular object at A. Energy matter at B, appears to be coming off of the rear of the triangular object and creating some type of a vortex around the rear of the object at A. Again, a circular/disc like object can be seen at C.
This picture is in the area right above the triangular object in the previous picture. 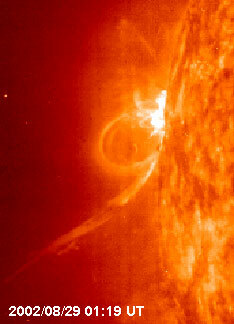 Notice the large wave of spiral like energy that shoots straight through, and pierces the center of the solar prominence in the picture. The wave of energy appears to be originating from the same exact direction where the triangular object is located. Triangular object is seen again at A. At B, a noticeable circular like vortex can now be seen surrounding the rear of the triangular object, as if it was some sort of an energy field that had been intentionally created by whatever the triangular object is. At C, the crescent shaped part of a large circular disc like object can again be seen, as if it is behind the sun. 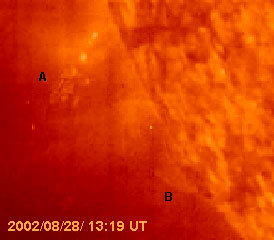 A bright white light or object is seen emerging from the large spacecraft/spaceplatform [SOL STATION] at A. At B, a circular type object can be faintly seen. The circular object appears to be below and behind A and the Sun. Energy appears to be coming from the back of the SOL STATION, spacecraft/space platform seen at A. 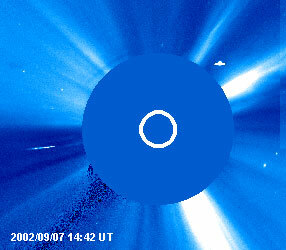 Part of a large circular disk can be seen hiding behind some solar activity at B. Following the dark line to the left of B straight up you come to a bright white object with a noticeable dark circle around it, as if the smaller white object is giving off some type of energy or force field, in order to mask or hide something. Another unusual winged flying object with the same shape as those seen in other images. Notice the fairly well defined large spacecraft/space platform, SOL STATION, indicated at position A, and the nearby smaller winged spacecraft at B, which appears to be flying towards the SOL STATION. At C, there appears to be an energy discharge coming from a partially obscured circular disc positioned somewhere behind the Sun. More and more of these sorts of images are showing up in SOHO pictures. In many of the pictures it looks as if the SOL STATION is intentionally creating activity to try and hide, or mask the large circular disc like object. Another flying spacecraft similar to B in the first picture. This is an overhead view of what appears to be the same type of object. 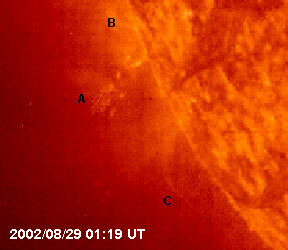 This object is flying across the face of the Sun, away from the direction of the SOL STATION in the first picture. Winged spacecraft is seen at A. The craft is very similar in appearance to the two object's seen in other SOHO pictures. SOL STATION is seen at A. Notice the energy that appears to be coming off of something obscured/hidden at D in the picture. Looking closer at position's B & C, relative to D, whatever it is that is being hidden, appears to be circular/disc shaped, and quite large. 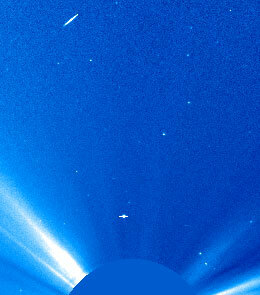 A winged spacecraft can be seen in this image flying near the rim of the sun. The space-station, space platform known as SOL Station Southeast can be seen in this EIT picture taken in mid-August 2002. 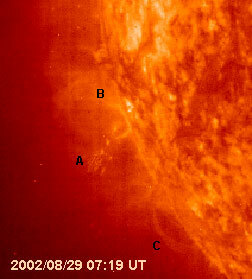 It is the large object in the picture, at an angle, and is positioned near the spot on the Sun where the solar activity is originating. 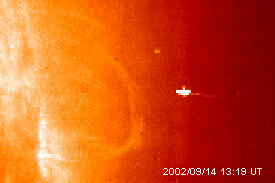 SolCruiser seen near the Sun in early September 2002. 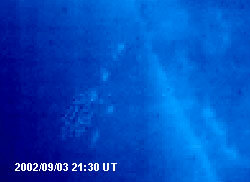 Up until September, SolCruisers have rarely been seen in EIT pictures. 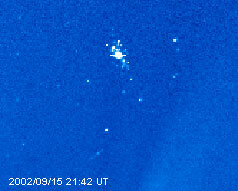 They are starting to be seen more and more in EIT pictures, and in increasing frequency in LASCO C3 pictures. "On the Wings and Rays of RA!" One of the most spectacular of the SunCruiser* images yet, this massive Ra ship is extremely noticeable - displaying itself on another day made up of the sacred Nine's, and displaying itself like the ancient images associated with those of the Winged Nibiru. Anyone listening yet!!! A new SunCruiser image is directly below this one. On Sunday, September 29, 2002, the following two pictures showed up on the current realtime files of the LASCO C3 database server for SOHO/NASA pictures. My first impression was: "Wow - two SunCruisers back to back!" Then my natural intuition and investigative nature kicked in - something looks way too perfect with these two images, and even possibly wrong with the 07:42 picture. Then I asked myself: "Where is the 07:18 picture - it's totally missing from the file line up? Did a basic check of the two pictures and then compared them a little closer. First, a physical overlay of the two pictures reveals that objects A & B appear at the same identical place in the two supposedly separate pictures, taken an hour apart. In addition, Object B, the three stars to the right of Object A, and Object A itself, all line up and align perfectly in both pictures. This is definitely something I would not expect to see especially with Object B. After studying many other objects similar to B over the past months and years, Object B, if it was acting normally, would have already left the view screen by the time the 07:42 picture was taken - at the least B would have moved from it's position in FIG 1 & 3 to a spot other than where it is currently shown at in FIG 2 & 4. There appears to be some slight graphic anomalies in the FIG 2 picture - some parts of the picture look slightly distorted, polished, as if it was possibly, even intentionally "scrubbed" and dubbed over, made to appear and look different than the 06:42 picture in FIG 1. 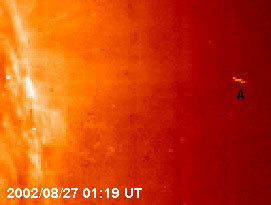 Analysis: The 07:42 UT picture looks too good to be true - almost as if the picture was purposely staged. The 06:42 picture looks OK - I suspect that this is the original picture. "Could NASA/SOHO be making a creative chess play? A gambit to use in their disinfo game - In hopes that one of us would take the bait and then they, NASA/SOHO and the Fed's, could come along with a plausible excuse to help aid in their continuing cover-up of what is really going on?" OK Sleuths & Investigators? We need your help. If the FIG 2 picture turns out to be some sort of a doctored and manipulated file, which I expect it very well could be, then NASA/SOHO has some big explaining to do. If they don't want to explain what is going on, then the creditability and believability of NASA/SOHO and the Fed's shrinks just that much more. NASA and the Fed's malfunctioning camera excuse problems and charged particles flying around and sticking to the camera lens just won't cut it this time around. When I first put up the SunCruiser and SOL Station SE web pages a month ago, the pages soared to the top rankings on the search engines in no time at all. The pages are still getting increased traffic flow, but suddenly all of the original and popular web pages, and the main site info, has all but disappeared from the search engines. This is the only link I could find a short time ago, and I fully expect to see it taken out of the search engines just as soon as the PTB's find out about it, and that it links to the other pages at Lamhfada Research Centre. Another funny thing, at the same time info started disappearing off the search engines about the web pages; myself, the articles and the pictures in them, started coming under a barrage attack by the disinfo. Guess we know pretty sure for at least now, who and what the disinfo link's and ties are - way to give away their hands! Maybe I could talk them into a hand or two of poker. 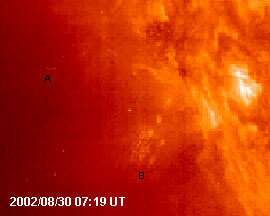 A SunCruiser can be seen headed towards the Southwestern quadrant of the Sun in this SOHO EIT304 picture. 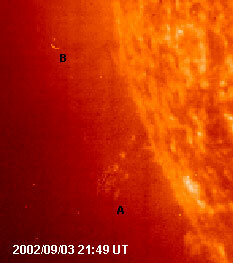 SunCruiser crossing the center of the optical [flat] plain of the SOHO CCD camera. 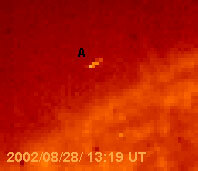 SunCruiser and smaller objects seen crossing the center of the optical [flat] plain of the SOHO CCD camera. 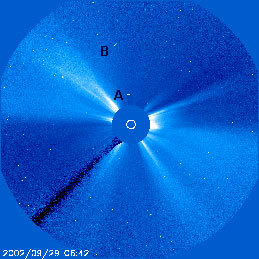 This latest SunCruiser was discovered on a LASCO C2 picture. "Pop In - Pop Out"
This SunCruiser was spotted hovering off the Sun at the 11 o'clock position of the Sun, on this LASCO C3 picture. 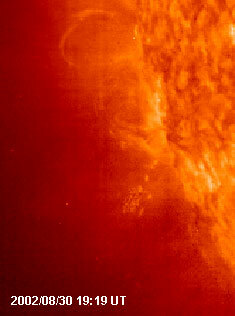 This SunCruiser was located earlier on the 24th, cruising around in a LASCO C2 picture. Ask and you shall receive. The third striking SunCruiser to show up in less than a twenty-four hour time span. "Here's a little razzle dazzle to make you notice us!" The second of two spectacular SunCruisers in less than 24 hours. Will their be a third? These extraterrestrial craft are putting on display's, as if they are intentionally provoking the powers to be on Earth, to openly acknowledge their presence. Well, at least some of us are watching and know these ET craft are where they can be seen. "Let me get a little closer to the camera for you..., do you see me yet!!!" This looks like one of the most defined images of the SunCruiser yet. 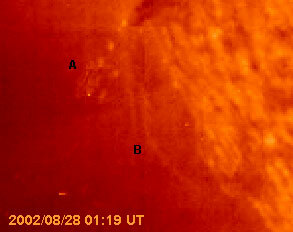 Notice the small dots next to the SunCruiser that seem's to be spelling out the letter "A"? The SunCruiser clearly seen in this recent EIT 304 picture taken on September 14, is doing it's dance at one of the four cardinal positions of the Sun. "DO YOU SEE ME YET - HEY - OVER HERE!" This SunCruiser image is very apparent and very bold in this LASCO C3 picture. "DO YOU SEE ME YET - HEY - OVER HERE!" 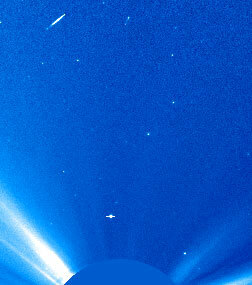 More and more SunCruisers are starting to be observed in SOHO LASCO C3 pictures, and in addition, they have started showing up in recent SOHO EIT pictures. More Proof that "We Are Not Alone!" Some have said that these are images of bright stars and/or planets. The problem with that type of 2-D thought process and way of thinking, is that if these captured images were truly bright stars and/or planets, then the images would appear on the LASCO C3 picture frames, before and after the LASCO C3 picture these captured images were taken from. These images do not appear in the immediate LASCO C3 picture frames before or after. In addition, the objects in question would show up on current star and planet charts - they don't. Looking closely at this latest image, there appears to be several unusual objects in formation around the larger SunCruiser. An earlier SunCruiser, next image, was spotted just ten hour's before this one. 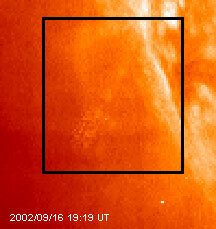 A fainter and similar appearing object can be seen at the 9 o'clock position, near the edge of the picture, in the original SOHO photo (above right). SunCruiser in the Northwestern Quadrant, 1 o'clock position of the picture. Notice the unusual phenomena near the 9 o'clock position in the picture.